Tetris was released in 1989 by Nintendo for the NES. 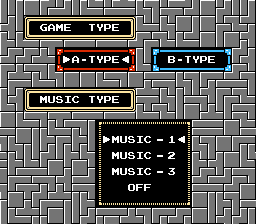 This is the “officialy licensed” version of Tetris as there were two different versions of Tetris published on the NES. 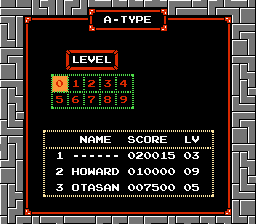 The “other version” was released by Tengen (an unlicensed publisher that was owned by Atari). The Tengen version of the game created a huge mess of legal problems for both Nintendo and Tengen. Tetris was one of those games that invited more than just the avid gamer. Adults and others who really didn’t play video games back in the 80’s started to play it and they quickly got addicted to the simple but challenging gameplay. This is something that made it one of the most famous games ever. The gameplay is simple and fun: create lines using different shaped blocks called “Tetraminos”. 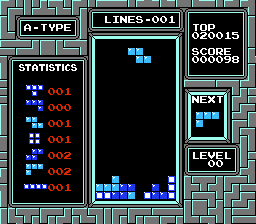 Clearing 4 lines at once is a Tetris which you get the most points for. There was a sequel on the NES but the gameplay was drastically changed so that while it still had the same name it really was an altogether different game. 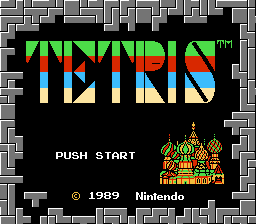 Tetris is one of the best selling NES games of all time. It is a must have if you own a NES. It was so popular that it was the included add-in game with Nintendo’s portable system the GameBoy.